The Midwest is a region of the United States of America known as "America's Heartland", which refers to its primary role in the nation's manufacturing and farming sectors as well as its patchwork of big commercial cities and small towns that, in combination, are considered as the broadest representation of American culture. In fact, most national television broadcasters speak with a midwestern accent. The American Midwest was the home of more than one quarter of U.S. Presidents as well as the birthplace of the inventors and entrepreneurs of most of the technology that fuels the world's economy- examples include airplane, automobile, electric lighting, the transistor, petroleum, steel production. The Midwest is also home to abundant nature including the massive Great Lakes and the vast Northwoods which cover northern Minnesota, Wisconsin, and Michigan and spill over into Canada making the far end of the upper Midwest very different in character to the more urbanized, agricultural, and industrialized lower Midwest. The Midwest contains many large cities, the largest being Chicago. See also the pages for the states of the Midwest, for smaller but still substantial cities in the region. According to the U.S. Census Bureau's 2005 population estimates, the region includes nine of the 25 largest combined metropolitan statistical areas in the United States. Chicago - the "Windy City" and the "City of the Big Shoulders", the largest city in the Midwest and the third largest in the U.S., with architecture galore, great musuems, fantastic beaches, and plenty of deep dish pizza to scarf down. Milwaukee - "Brew City", "Cream City" and the "City of Festivals"
Cuyahoga Valley National Park — one of the country's busiest national parks, along the Cuyahoga River south of Cleveland. Great Lakes — the "North Coast" of the United States, the largest group of freshwater lakes on Earth by total surface area and volume. Indiana Dunes National Lakeshore — beautiful dunes and beaches, hidden on the industrial northwest coast of Indiana. Isle Royale National Park — a beautiful, wild island in Lake Superior at the northern tip of the Midwest near Ontario, Canada. Mall of America — the country's largest shopping mall. Ozarks — the famous lakes and hill country at the intersection of Missouri, Arkansas, and Oklahoma. Sleeping Bear Dunes National Lakeshore — enormous dunes in a wild part of Northern Michigan. 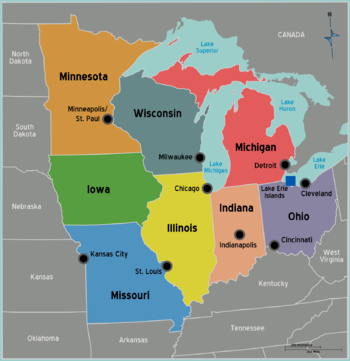 The term "Midwest" refers to a collection of states just east of center in the United States. This area is sometimes referred to as the "heart" or "rust belt" of America and is often associated with agriculture and industry (historically manufacturing but this has faded as years have passed). The culture of the Midwest is generally acknowledged to be "down to earth". States bordering the Great Lakes (Illinois, Indiana, Michigan, Minnesota, Ohio, and Wisconsin) are sometimes called the "North Coast", "Third Coast", or "Fresh Coast" (in reference to the freshwater Great Lakes) as parallels to the East Coast and West Coast. English is, as in the rest of the U.S., the de-facto official language. The "Midwestern Accent" is the voice most commonly heard on national newscasts across the country. Some areas with large Hispanic populations might have a sizable majority speaking Spanish, but inhabitants there have at least basic English skills. Most of the larger cities have sizable diverse ethnic communities with many first generation immigrants. Extreme southern and northern portions of the Midwest have their own minor linguistic quirks, but generally the English spoken here is among the easiest dialect to understand in all America. Chicago, Milwaukee, Saint Louis, Detroit, and Indianapolis all have sizable African-American minorities with their own distinct accents, slang, and forms. The southern parts of Indiana and much of Missouri are often classified as part of the Midsouth and share some things in common with the Southern cultural sphere. The Midwest is served by several international airports, including many of the major US airlines' national hubs. Chicago-O'Hare (United, American, Frontier, and Spirit), Chicago Midway International Airport (Southwest), Detroit (Delta and Spirit), Minneapolis-Saint Paul (Delta), Milwaukee (Southwest) and Lambert–St. Louis International Airport (Southwest). Chicago O' Hare in particular is also served by many direct flights from numerous foreign carriers as well such as Copa Airlines, Aeromexico, Japan Airlines, Korean Air, KLM, Lufthansa, British Airways, Icelandair, Qatar Airways, and Emirates. I-24 - connects southern Illinois to the Southeastern U.S.
I-39 - gives traffic from north and northwest a bypass around Chicago when heading south. I-43 - Links Milwaukee to I-39, thus allowing them to avoid to Chicago to get further south. I-44 - begins in St. Louis, runs through the Missouri Ozarks into Oklahoma and Texas and thus provides an important link between the Midwest and Southwest. I-57 - gives Chicago traffic an alternative to I-55 in getting to Memphis and bisects Illinois vertically. I-64 - starts in St. Louis and connects it with southern Illinois and southern Indiana through Evansville, and ultimately to Virginia. I-64 is an important east-west corridor linking the Midwest to the Southeast. I-72 - Planned to run from St. Joseph, Missouri eventually. Currently links Hannibal, Missouri to Champaign-Urbana, Illinois via Springfield, Illinois. I-88 - relieves congestion on I-80 between the Quad Cities and Chicago. I-94 - Links Detroit, Chicago, Milwaukee, Minneapolis and points west together. Greyhound offers passenger bus service from many U.S. cities. Megabus is a low-cost bus company primarily offering service in the Midwest connecting its hub in Chicago to Ann Arbor, Cincinnati, Cleveland, Columbus, Des Moines, Detroit, Indianapolis, Kansas City, Memphis, Milwaukee, Minneapolis, St. Louis and Toledo. Great Lakes - The northern Midwest can be traversed by boat throughout the Great Lakes. Many boaters utilize the Great Lakes, St. Lawrence Seaway and their connection points as a travel route. The Lakes Cruising Company and the American Canadian Caribbean Line provide cruises with several Midwest cities (including Chicago, Cleveland, Detroit, Milwaukee) in their itineria. River Travel - Additionally, the Mississippi, Missouri and Ohio Rivers are some of the primary navigable waters in the US. There are also steamboat and cruise options connecting points along Ohio and Mississippi Rivers. Many major metropolitan areas also have secondary international and regional airports, supporting national, discount and commuter airlines. In addition to the major interstates listed above, many Midwest cities have secondary interstate service such as outerbelt and by-pass systems. Medium-sized cities in the Midwest, like the rest of the nation, may lack city-suburban rail service, although Amtrak routes may suffice in some case. Chicago, however, does have city-suburban rail service in its expansive Metra rail; as well as being the national hub of Amtrak, with service radiating out to all parts of the country. Lake Erie Coastal Ohio Trail - including Northern Ohio and Southeastern Michigan. Lake Erie Islands. Located west of Cleveland, Ohio and southeast of Detroit, Michigan, a group of picturesque and festive islands in Lake Erie are accessible via ferry. In addition to several Ohio State Parks  located on the islands, there is plenty to do including wineries, restaurants, bars, marinas and beaches. North Shore Scenic Drive - Along Lake Superior in Minnesota, this picturesque route is popular for stunning vistas of the water and beautiful fall foliage. Follow Minnesota Route 61 northeasterly from Duluth all the way to Thunder Bay, Canada. The Mackinac Bridge - Connecting the two peninsulas of Michigan via I-75. An engineering marvel and an important transportation artery. Beaches, great beaches in the city of Chicago, as well as the dunes in nearby northwest Indiana along Lake Michigan. Fishing, with many charters in most major cities to choose from. Boating, in and around the Apostle Islands in northern Wisconsin. Lighthouses worthy of a picture in Wisconsin's Door County. Resorts along the Traverse City area of Michigan. Casino riverboats in various states in the Midwest. Rafting and tubing along the Wisconsin River in Wisconsin Dells, Wisconsin. Boatwatching along the Mississippi River in Hannibal, Missouri, Mark Twain's hometown. The Twin Cities is the third-largest theater market in the United States, and second-largest per capita, supporting many companies including the Jungle, Mixed Blood, Skewed Visions, the Brave New Workshop, Theater Latté Da and the Children's Theatre Company. Three historic theaters, the Orpheum, the Pantages, and the State Theater line Hennepin Avenue. St. Paul's Fitzgerald Theater is the home of the nationally-renowned program "A Prairie Home Companion," owned by National Public Radio. The Chanhassen Dinner Theatres in Chanhassen, Minnesota, founded in 1968, is the largest professional dinner theater in the U.S.; the Main Stage seats 577. Arguably the center of the Twin Cities theater scene, the Guthrie was founded in 1963 and has been located along the Mississippi River since 2006. Its current facility, designed by French architect Jean Nouvel, was named in 2006 one of GQ Magazine's 10 Most Important Buildings for the 21st Century. Of its three theaters, the 1100-seat thrust theater is the largest, followed by the 700-seat proscenium stage, and the flexible black box studio. Touring companies stop frequently at venues across the Midwest, especially in the cities of Chicago, Minneapolis-St. Paul, and St. Louis. Chicago in particular has long been an important stop for New York-based touring productions, mainly playing out of theaters in "The Loop." Chicago theatre is home to more than 200 small, critically acclaimed theatre companies such as Lifeline Theatre, Remy Bumppo Theatre Company, Redmoon Theater, Trap Door Theatre, and TUTA Theatre. Some have their own performance venues, while many perform in untraditional theatre spaces such as storefronts, public spaces like laundromats or bars, or any number of studio or black box theatres around Chicago. The worldwide scene of house music was crafted in Chicago in the early 1980s, and went global by the 1990s. Industrial music was also created in Chicago in the late 1980s/early 1990s. Chicago, St. Louis, and Kansas City have legendary jazz and blues clubs. Many of the greats have not only traveled the region extensively whilst on tour, but more than a handful were born or resided in the region, with these cities leading the way. The Midwest is a patchwork of big cities, small towns and farming communities. Being the epicenter of the American Industrial Revolution, it attracted an influx of immigrants and African Americans in the late 19th and early 20th centuries, resulting in a diverse ethnic culinary experience from the heavy German, Irish, Polish and African-American urban populations to rural Amish and Mennonite cooking traditions. Big Midwest cities, like Chicago, St. Louis, Cleveland, Detroit and Milwaukee, are known for their bratwurst, kielbasa, Italian sausage and good old American hot dogs. Smaller, rural clusters, like the German Amana Colonies, in east-central Iowa, are home to some of the best German-American food in the Midwest. Known for family-style dining, the Amana Colonies provide hearty foods the Midwest is known for. Chicago is a melting pot of various cultures. Parts of Minnesota and Wisconsin have a Scandinavian influence. Locally grown food is seasonally available in rural areas, often at roadside stands. Spring crops include salad greens, radishes, sweet peas and spinach. Summer's abundance includes sweet corn, tomatoes, squash, cucumbers, onions, melons, berries, apples, cherries, peaches and pears. The agricultural abundance can be excellent in season and seems to encourage large helpings year around. Beer - Major domestic breweries, Anheuser-Busch (recently acquired by InBev) (St. Louis) and Miller (Milwaukee) are headquartered in the Midwest. Many renowned microbreweries dot the landscape as well, including Summit (St. Paul), Goose Island (Chicago), Great Lakes (Cleveland, OH), Bell's (Kalamazoo, MI), New Glarus (New Glarus, WI), Gluek's (Cold Spring, MN), Schell's (New Ulm, MN), Leinenkugel (Chippewa Falls, WI). Millstream Brewery, located in the Amana Colonies, Iowa is home to the world's best (2010 World Beer Cup, Gold medal winner)Vienna style lager beer. Wine - Wine is made in every state of the Midwest. Catawba grapes were first discovered in Ohio in 1802 and thus Catawba vineyards line the shores and islands of Lake Erie. Michigan and Missouri also have significant wine countries. The Amana Colonies, located in Iowa, is home to five wineries featuring their traditional sweet, fruit wines, as well as many varieties of German and French-style wineries. Iowa is home to almost 90 wineries, many featuring the unique flavors of "cold-climate" grapes. Dial 911 from any telephone for emergency police, medical, and fire services. The call will be free of charge. This should not change from town to town or state to state, since all police, fire, and medical emergency services throughout the USA and Canada are tied into the 911 service. The rural areas and quaint small towns of the Midwest are among the safest for travelers and residents in all America. Parts of the larger cities should be avoided after dark. Weather in the Midwest can range from heat waves in July and August, to very cold weather in January and February. Tornadoes are common in the Midwest in the springtime, but ample warnings are often given to help protect property and lives. If the weather on the road appears to be turning inclement, local radio and television stations will continuously offer advice and information. Residents that are living in the Midwest States are permitted to carry firearms after a full security background check. They use guns for hunting and defense. DO not walk into property that you dont know as the people uses the guns for self defense.